Even now writing this review, I am still quite shaken up by Foxcatcher. Once in a blue moon, I am left speechless by a film. Foxcatcher has had that effect on me. Based on a true story, on the outside Foxcatcher appears to be about American wrestling but is so much more than just another sports movie. Olympic champion wrestlers Mark Schultz (Channing Tatum) and, his brother Dave (Mark Ruffalo) are invited by multimillionaire and sports enthusiast John E. du Pont (Steve Carell) to join his ‘Foxcatcher’ wrestling team, compete in the Olympics and, ultimately, aim to become the best in the world. What follows this partnership though are circumstances and events that are dark and distressing, and if you don’t know the story already, go in to the cinema clueless and unknowing. 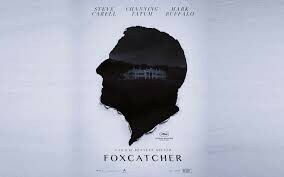 The name Foxcatcher comes from the immense family estate and farm owned by the du Pont family, but I felt the name meant more than that. The chase that ensues on securing both the Schultz brothers is like a hound hunting a fox, and du Pont did indeed get what he desired and “caught” them. In addition to his wrestling obsession, du Pont was an ornithologist and avid bird watcher. The use of bird imagery and even with his nickname “Eagle” I could certainly see the resemblance of a bird in both his tenacious manner and odd appearance. He leers over Mark and Dave, hunting and circling them both, like a bird of prey. Channing Tatum as Mark Schultz has taken a leap from heart throb/action star to serious actor in this film with ease and in a role that was well suited for him as a beefy wrestler. At times, Tatum really showed moments of vulnerability that weren’t hammed up, but instead subtle and understated. Mark Ruffalo was equally brilliant as Dave Schultz, the more mature and charismatic older brother. Talented, supportive and loving to his family and Mark, he was a welcome, calming presence in scenes. This is a polar opposite of John du Pont, of course, a character who fascinated me the most. As du Pont, Steve Carell created an unnerving, uneasy atmosphere, so extreme that, at times, I found him quite difficult to watch. Unpredictable and unstable, his presence and demeanour is truly chilling and I was on edge for the entirety of the film. What I also found interesting is in several interviews I’ve read with Steve Carell (Radio Times, The Guardian etc), he’s said that his look and his whole bearing was so off-putting that people would avoid him on set, adding to that sense of separation. Bennett Miller has directed such a sophisticated biopic; some use of cinematography and dialogue will stay with me for days. What is also clever is his choice of shots and the use of imagery: the birds, the constant repetition of the word “Foxcatcher”, use of certain objects throughout and references back to the civil war and the farm previously being a battle field. All of these things amount to foreshadowing the shockingly tragic yet unsurprising end. The extreme lack of music too created unbalance, letting you hear everything, down to the dissonant squeaks of the wrestlers shoes on the floor. Any prominent sound came as a shock, and rang out through the cinema. I remained incredibly tensed up throughout (so did my friend who came to see it with me), and come the end when I could finally relax and the credits began to role I actually started to cry. And I wasn’t expecting that, similar to how I wasn’t expecting anything as remotely powerful, formidable and disturbing as the story or Steve Carell as John du Pont.